The next step-change innovation from Advanced Bionics will be the approval and launch of the Naída CI sound processor, ready for EAS (electro acoustic stimulation). This offers the full integration of Advanced Bionics and Phonak technology for recipients with some residual hearing who are seeking the most natural-sounding hearing experience. 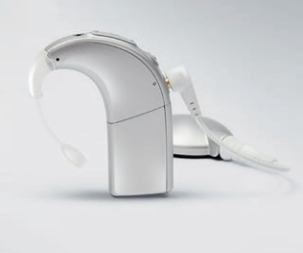 The processor combines the electric sound signal from an Advanced Bionics cochlear implant with acoustic sound from a Phonak hearing aid. The combination of electrical and acoustical stimulation should allow recipients to hear high and low frequencies for a more natural hearing experience and improved music enjoyment.